[T]his French novel called L’auberge des Trois Rois (The Inn of the Three Kings), by Jules Beaujoint, was published by A. Fayard in Paris around the year 1888. It is part of a series called Les auberges sanglantes (The Bloody Inns), among them a very long novel of 1,910 pages, no less, about the famous and authentic case of the Peyrebeilhe inn, in the Ardèche in central France — where the inn’s owners killed off their wealthy clients. In the early 1950s it was the basis of a Fernandel movie, L’Auberge Rouge, directed by Christian-Jaque, recently remade starring Christian Clavier and Josiane Balasko. [N]ovel number three in the series, L’auberge des Trois Rois (1289 pages), is about a barber who kills his wealthy clients to have their corpses used by his (male) accomplice to make meat pastries. They have another accomplice, an old woman, who kidnaps abandoned children in the streets of Paris… The barber’s name is ‘Barnabé Cabard’ and by all evidence, this tale’s an adaptation of an old French crime legend related in other, much older sources. The shocking happening supposedly took place in late 1415, the year Henry V invaded France and won a major British victory at Agincourt. 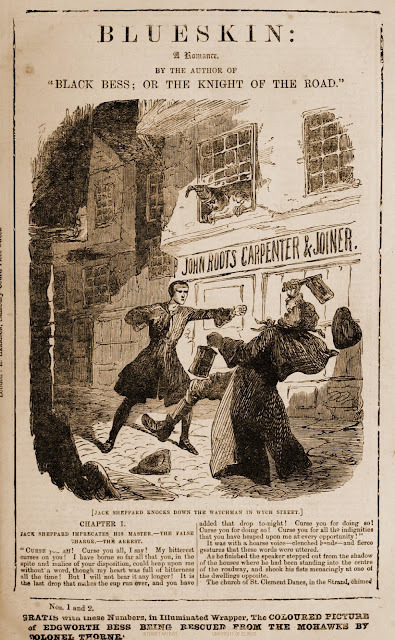 [F]or this book a series of gravures was produced that was quite reminiscent of the pictures for the original British Sweeney Todd serial of 1846-47 and the 1880s penny dreadful Sweeney Todd; the Demon Barber. Jules Beaujoint also wrote a romance about Cartouche, the famous French thief. Both Sweeney Todd; the Demon Barber and Cartouche; the French Jack Sheppard had been issued in penny numbers by Charles Fox in London around 1881-82. The full page illustrations, which served as the Fox penny number covers, were a departure from the usual method of having an illustration take up two thirds of a page. [J]ames Malcolm Rymer gave Cabard the British name Sweeney Todd in The String of Pearls; a Romance, serialized in Edward Lloyd’s The People’s Periodical in 18 instalments between November 21, 1846, and March 20, 1847. See also Sweeney Todd Gallery HERE. Read Beaujoint’s L’auberge Peirebeilhe HERE. Read Beaujoint’s Cartouche, roi de voleurs HERE. 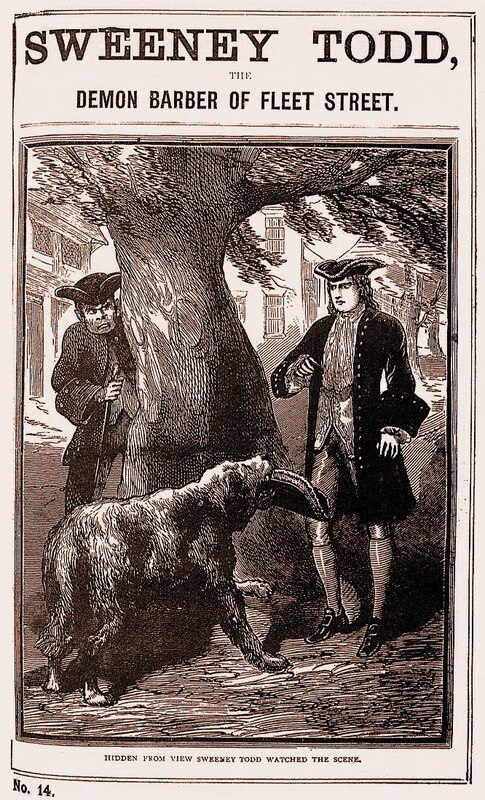 Black Bess, Volume I, No. 1. 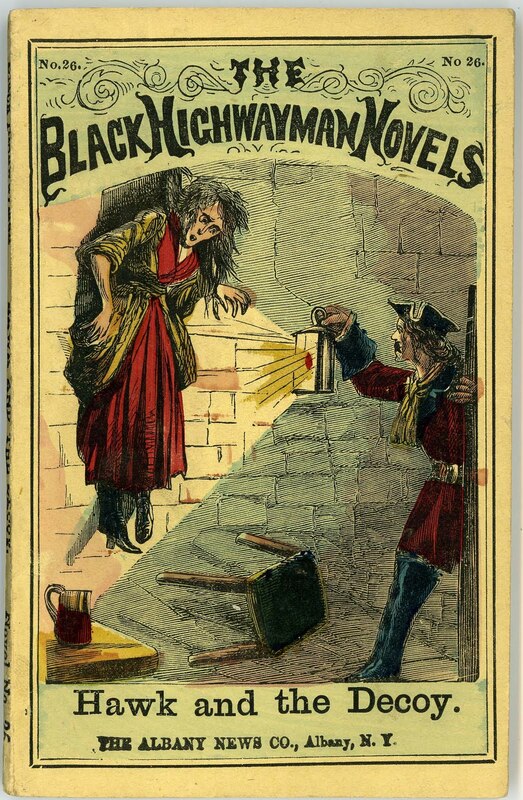 THE FIRST penny weekly number of Black Bess; or, The Knight of the Road; A Tale of the Good Old Times, by an anonymous author, was published by Edward Harrison on August 8, 1863. The serial comprised 254 eight-page penny weekly numbers, ending just short of five years later in 1868. 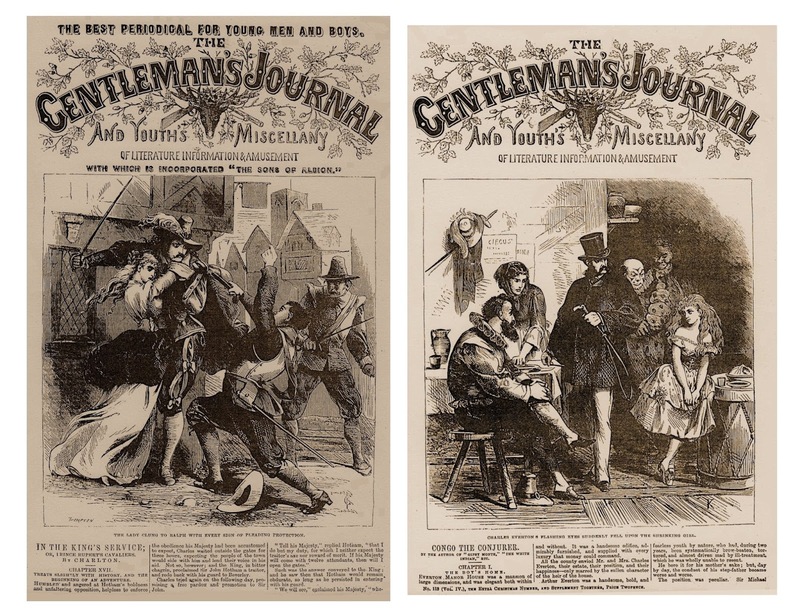 On July 1, 1868 an article was published in The Bookseller under the title ‘Mischievous Literature’ in which Black Bess, Blueskin, and The Black Highwayman — all published by Harrison — were mentioned as the work of one man. Blueskin, Volume I, No. 1. ACTUALLY, the first number of Blueskin; A Romance of the Last Century appeared a few days before Black Bess commenced. It was advertised in newspapers on August 2, 1863, and ran to 158 numbers, 1259 pages, ending in 1866. 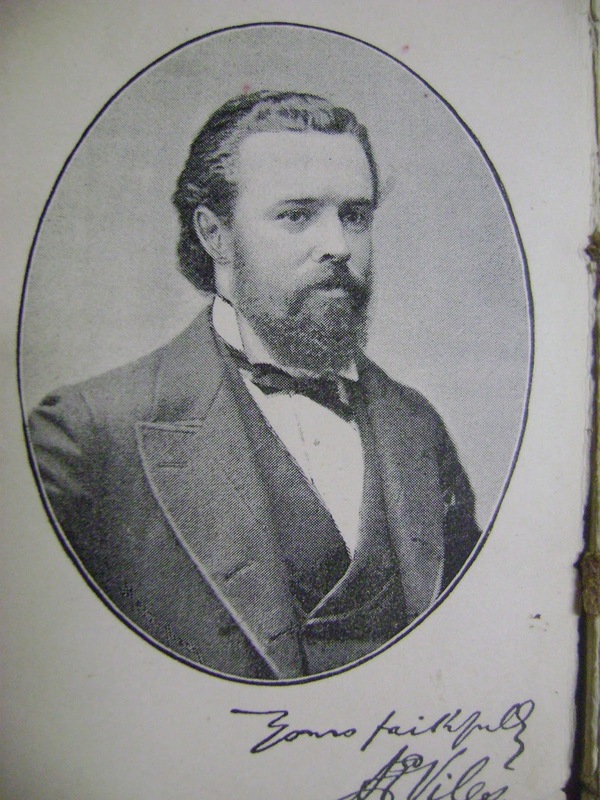 Montague Summers, in his A Gothic Bibliography (Fortune Press, 1941), claimed that Viles was a charming, generous man, whose main weakness in life was an urge to appear in the public eye as what he was not — an author. A Gothic Bibliography was groundbreaking at the time it was published but has proven unreliable in many of its remarks on authors and publications. 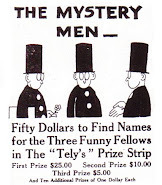 Two of his informants misled him, Australian bookseller John P. Quaine with his invented penny dreadful titles, and Andrew de Ternant with his author information. 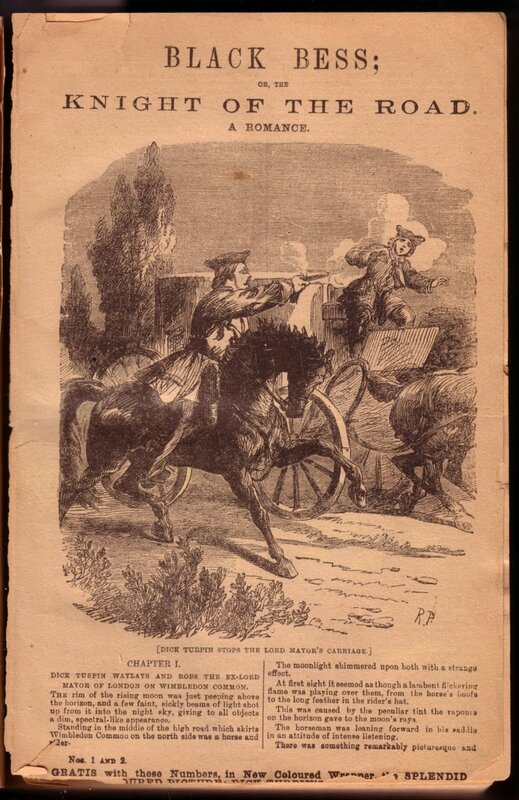 The Black Highwayman; Being the Second Series of Black Bess; or, The Knight of the Road was, according to Frank Jay, published in 86 numbers, 688 pages between 1866 and 1868, concurrent on the newsstands with the last two years of Black Bess. The copy John Adcock examined was a reissue from Edward Harrison in 172 weekly numbers at 688 pages. No title page, no date, but it did sport a colour cover and beautiful colour plates. In that copy the plates changed from full colour to black and white by plate issue no. 7. Nos. 1 and 2, with a coloured engraving, were given away with George Purkess’ Illustrated Police News on March 13, 1869 to promote a reissue. The Reader, November 26, 1864, pp.673-74. Viles was well-read in literature as noted by his correspondence to the editor of The Reader on November 26, 1864 under the title Illustrations of Slang, Cant, and Vulgar Words. 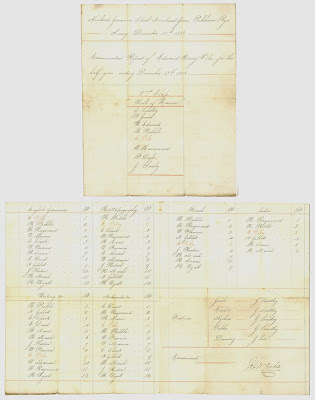 Edward Viles’ Examination Report, Nunhead Grammar School, December 15, 1853. He has also been attributed as the author of Gentleman Clifford and his White Mare Brilliant; or, the Ladies’ Highwayman, published anonymously in 1864 by Edward Harrison. While possible there is no proof of Viles’ authorship. 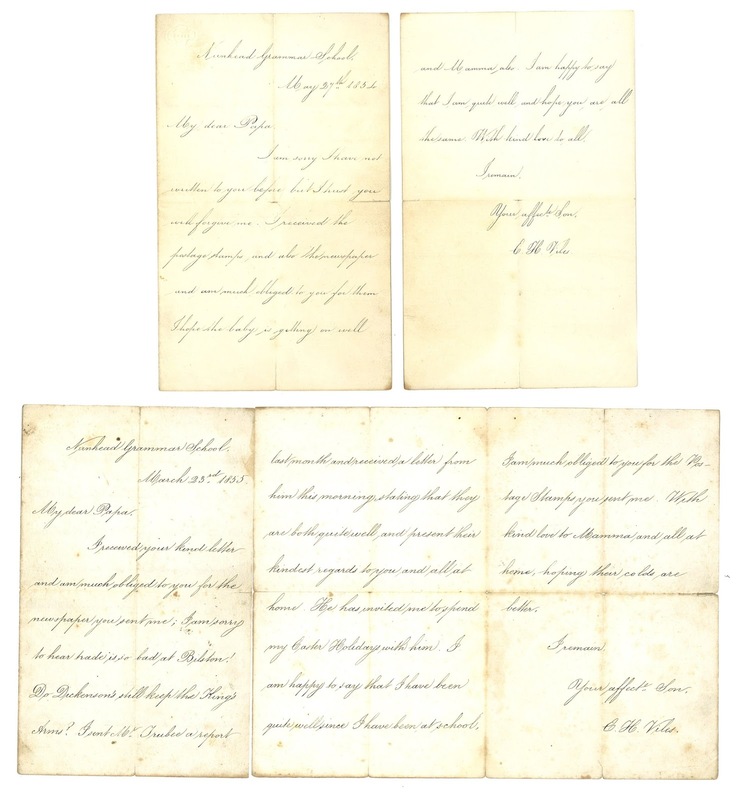 Edward Viles’ letters to his Papa from Nunhead Grammar School, May 24, 1854 and March 25, 1855. Edward Viles was born Edward Henry Viles on November 21, 1841 at 41 Free-school Street, St. Olave's Parish in Southwark to Henry Andrew Viles, and Eliza Viles (formerly Lucas). 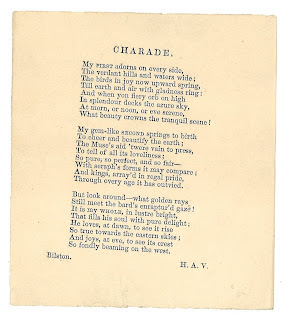 ‘Charade,’ a poem by Henry Andrew Viles. The Four Cardinal Points, by Henry Andrew Viles. By 1851, now a clerk residing at Lichfield Street, Bilston, Staffordshire, married to Eliza A. Viles, 29 years of age. They had four children of whom Edward Henry was the oldest at nine. Seven more children followed. The children (by age) were Emily Eliza, Edward Henry, Clara, Kate, Walter Percy, Arthur Ernest, Herbert Horace, Sydney Wybuirn, Edith, and Tenbee (?) S. or Trubee (?). Birmingham Gazette, July 27, 1861. All of a sudden father H.A. Viles lost his job. 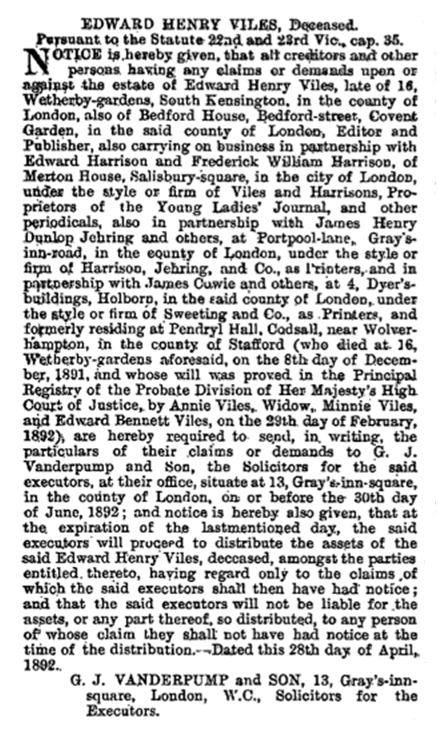 On July 27, 1861 Henry Andrew Viles’ employers, the Bilston Town Commissioners, charged their longtime clerk with embezzling a cheque for £500. The jury recommended mercy but Henry Viles was sentenced to sixth month’s hard labour. His son Edward Viles was now 19 years old, employed as an Accountant Clerk, and Walter Percy was ten, staying with Charles Paget, railway agent, and his wife and daughter at Wombridge, Shropshire. His son Arthur Ernest Viles, who would spend his life as a printer’s reader, author, editor and journalist, was eight, and stayed home. When Henry Viles returned from gaol he moved the family to London and opened a coffee shop, he was subsequently bankrupted in 1863. 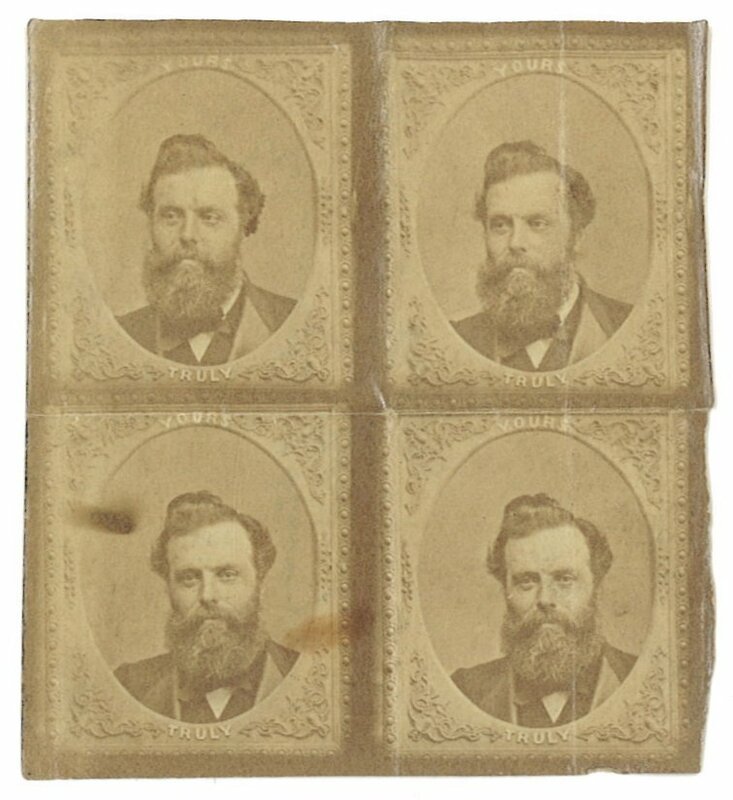 He established himself as a publisher in Cary Street and was bankrupted again in 1867. 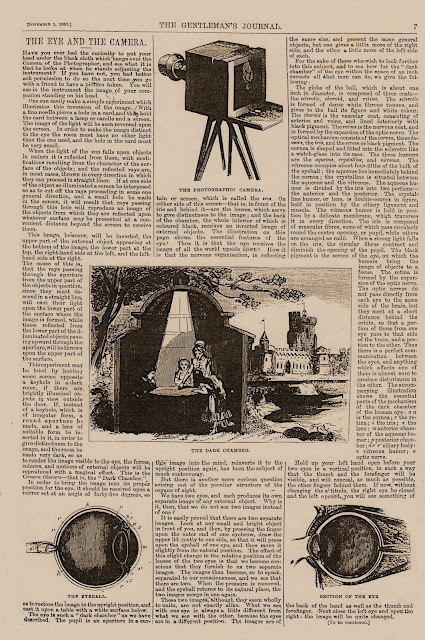 Boy’s Miscellany, September 19, 1863. 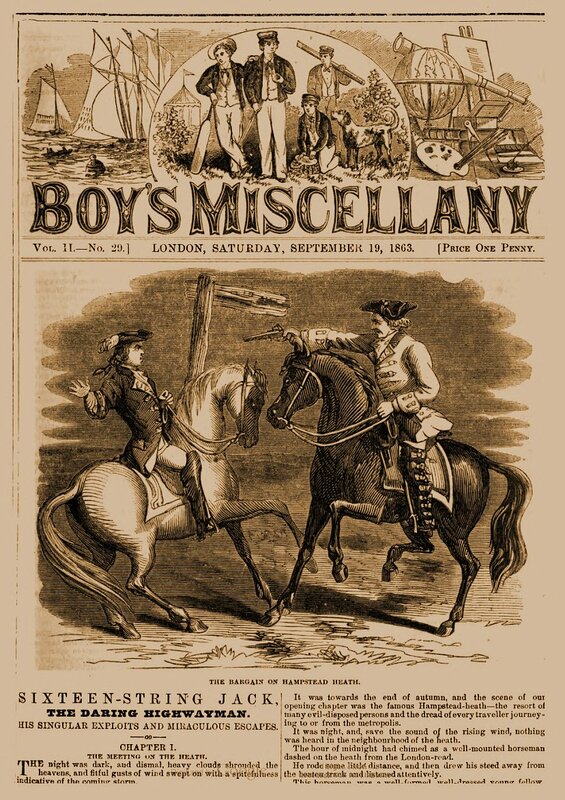 Edward Viles was possibly involved with Harrison’s Boys’ Miscellany, described by Frank Jay as “essentially the first periodical of what we may term the sensational character,” which preceded Black Bess, appearing weekly from March 7, 1863 to February 27, 1864. 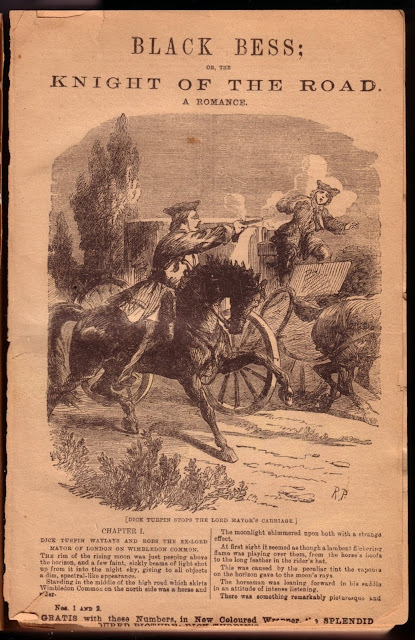 The September 19, 1863 issue began serializing the anonymous “Sixteen-String Jack, the Daring Highwayman.” The serial was also issued in penny weekly numbers as Jack Rann; or, Sixteen-String Jack, the Noble-Hearted Highwayman. The Gentleman’s Journal, Volume IV, nos. 108 and 114. Viles, In addition to writing Black Bess, was occupied with the Young Ladies’ Journal which ran from April 13, 1864 to February 1920, and The Gentleman’s Journal running from 1869 to 1872 when it merged with the Young Ladies’ Journal. Frank Jay said both periodicals were published by Edward Harrison and Edward Viles. 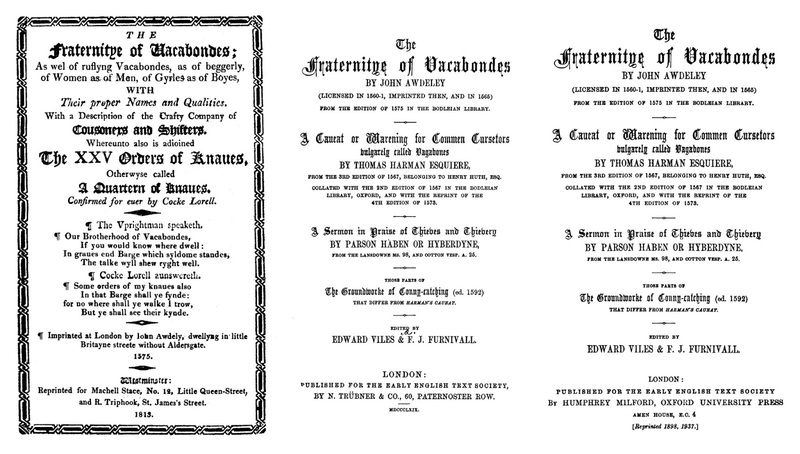 He was also assisting the eccentric Frederick James Furnivall with editing a reprint of John Awdely’s The Fraternitye of Vacabondes which was published in 1869 by the English Text Society. 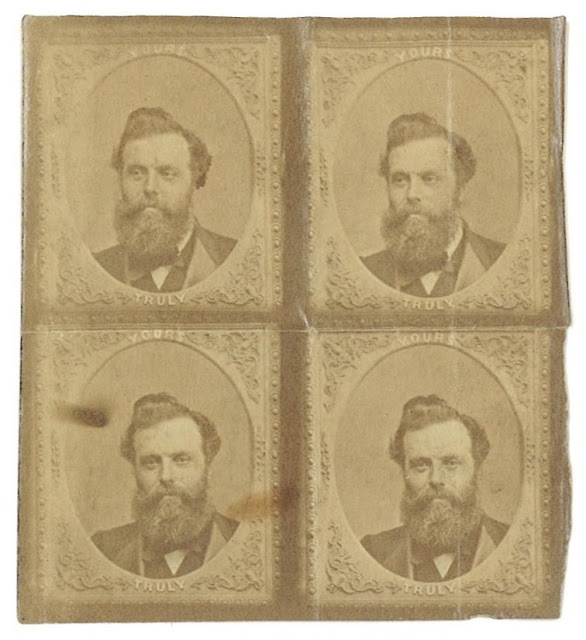 Four Photographic Views of Edward Henry Viles. Today it is known as Pendrell Hall, an exclusive country house available as a wedding venue with accommodation. In 1877 Viles photographs were exhibited at the Royal Photographic Society and his articles appeared in many photography periodicals. One photograph was an enlargement of the proboscis of a blowfly, another of the tongue of the honey bee. The Gentleman’s Journal, November 1, 1869. By 1864 his father Henry Andrew Viles, a free man again, had turned to publishing. An advertisement in The Times on October 7, 1864, page 2 read: The Orator; A Treasury of English Eloquence. Monthly 6d. Part II now ready, H.A. Viles, 34 Carey-street, W.C. and all booksellers. 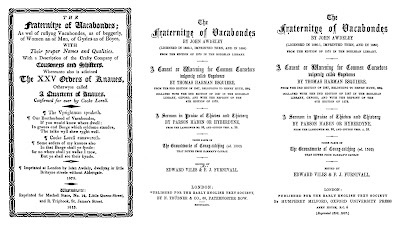 In 1865 (reissued in 1873) he edited The Imperial Speaker; containing the most celebrated readings and recitations in the English Language – see HERE. 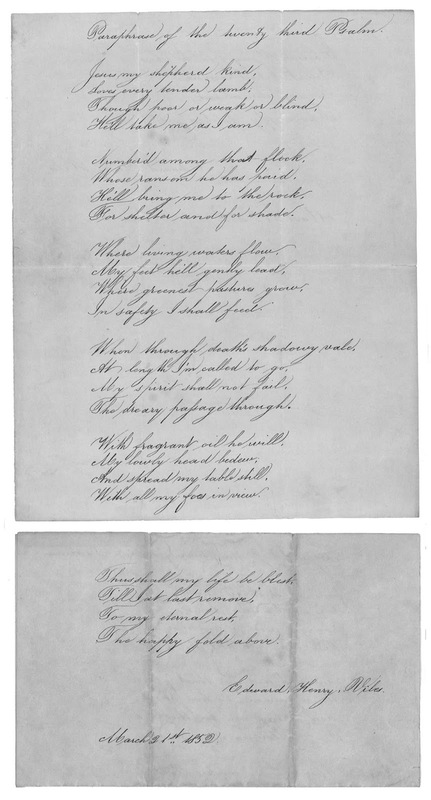 Black Bess, a poem by Henry Andrew Viles, in The Imperial Speaker, 1865. Among the poems, ancient and modern, is one titled ‘Black Bess’ authored by Henry Andrew Viles himself (the authors of the poems are listed on the end pages). The first edition was published by none other than Edward Harrison. The inscription on the front flyleaf of The Imperial Speaker in Hester Viles’ possession is: ‘Walter Percy Viles, With love from Aunt Clara 13/10/98’. This book was given to Walter Percy Viles, Jr. from his aunt Clara, the sister of Walter Percy the elder. 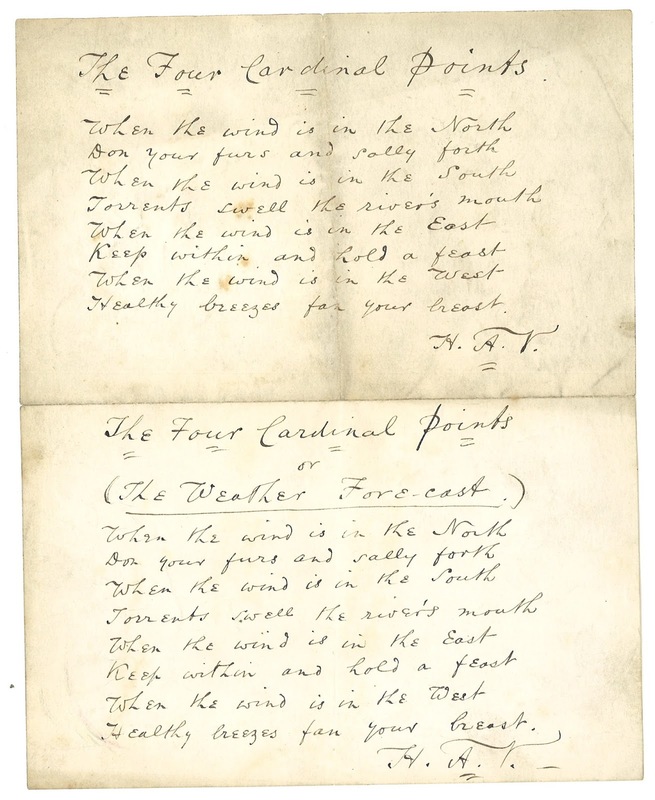 One last work by Henry Andrew Viles was The Imperial Pocket Reader – see HERE. Walter Percy Viles, December 19, 1874. Wood-engraving clipped from full-page publication HERE. 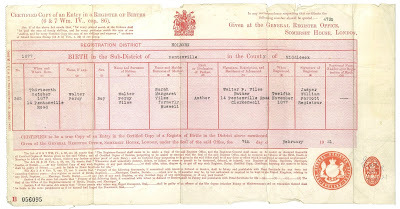 Walter Percy Viles was born December 22, 1850 at Bilston, Staffordshire. 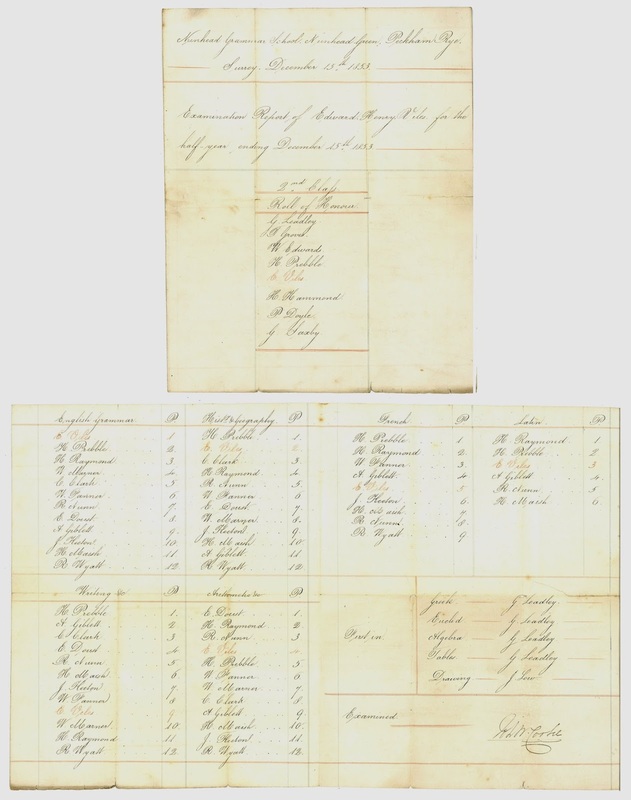 In the 1861 census,his name is not listed among the children. 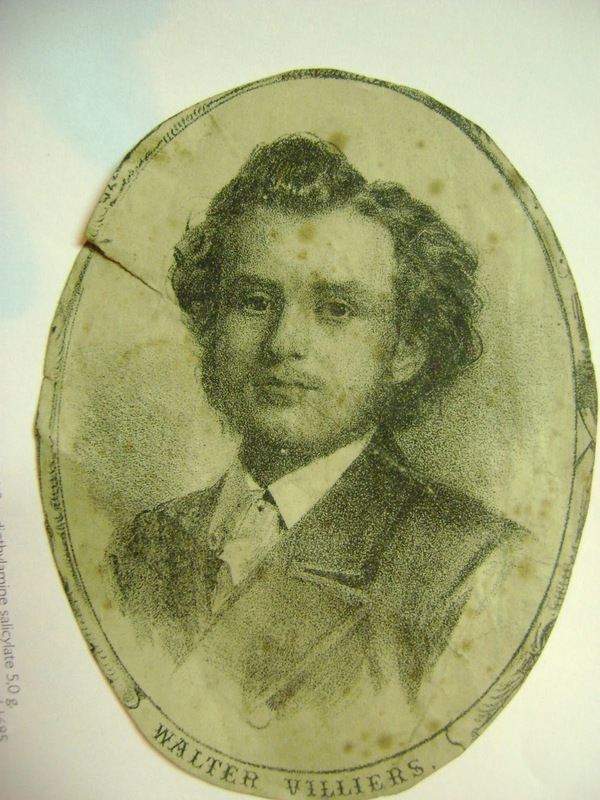 But in the 1871 census, he is living at home and listed as a twenty one year old Author. At that time his younger brother, fifteen year old Arthur Ernest Viles, was listed as a printer-reader. 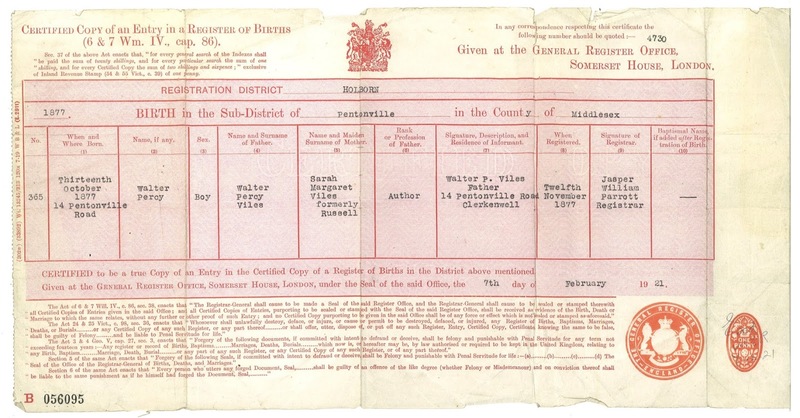 Birth Registry for Walter Percy Viles the younger. 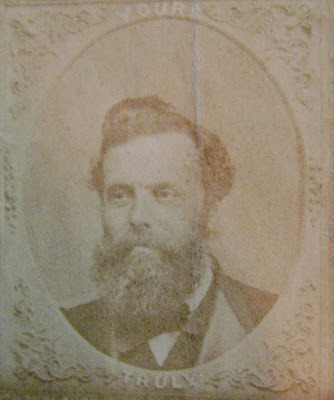 Walter Percy married Sarah Margaret Russell. One of Walter Percy and Sarah Margaret Viles’ children was also christened Walter Percy Viles. The son was born October 13, 1877, at 14 Pentonville Road, Pentonville. He had a sister, Alicia May, who married a man with the surname of Hall. 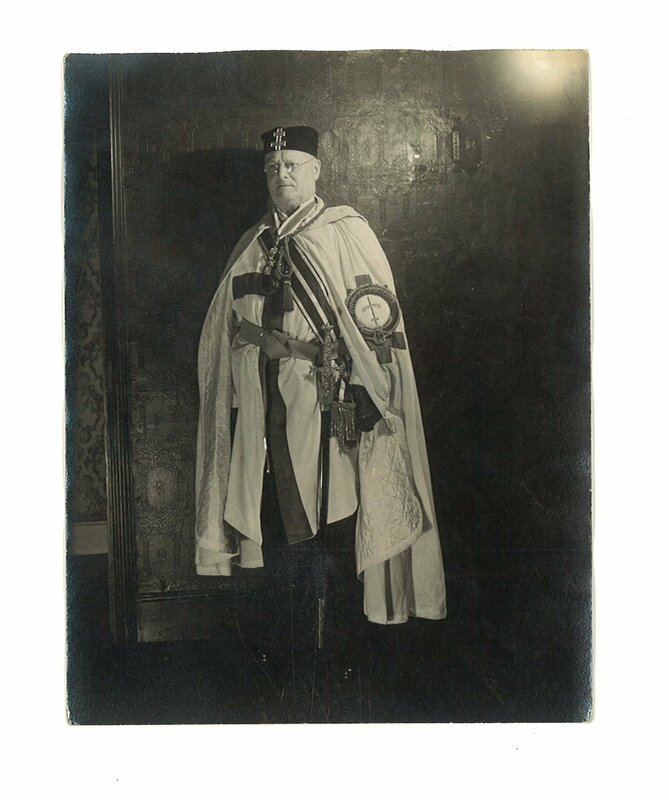 Walter Percy Viles the younger in “Past Preceptor Knights Templar” uniform. The 1891 census record shows Walter jnr. as being the stepson of James Ellis, a Bench Attendant at the Inner Temple Hall. He married Amelia Giles on September 1, 1900, in Tottenham. In 1901 they were living in Tottenham with Walter earning his living as a solicitor’s clerk. By 1911 they’d moved to Camberwell. 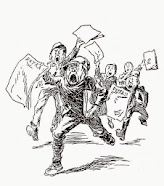 In March 1921, by this time an Oil Merchant, Walter was granted the freedom of the City. He died at 16 Queenswood Drive, Hitchin on February 27, 1956 leaving an estate worth £3,301 17s 2d to his wife. Walter Richard Viles en route to South Africa, 1929. Their children were Doris Clara born June 1, 1901, Mildred Kathleen born October 19, 1906, Walter Richard, 1908, and Henry Andrew born September 22, 1910, Edward George, 1914 who died as a baby, and Percy Augustus born July 24, 1917. Walter Richard Viles moved to South Africa in 1929. The family photographs shown here for the very first time came down through his family and are now in the possession of Hester Viles. 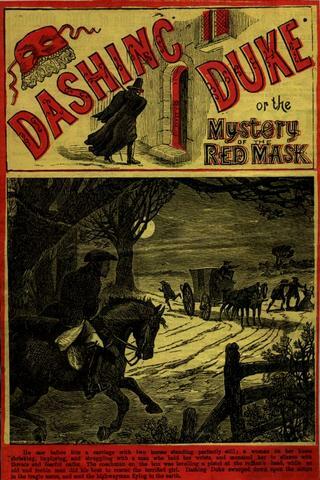 Dashing Duke; or, the Mystery of the Red Mask, Hogarth House, 1878. The elder Walter Percy Viles wrote boys stories using the pseudonyms Walter Villiers, Frank Mercer, and Benchley Beaumont. The British Library credits him with the penny dreadful Dashing Duke; or, the Mystery of the Red Mask which was serialized in The Boys’ Standard beginning in no. 120 in 1878. Dashing Duke was reissued in penny numbers by Hogarth House. We have not been able to trace any source for the British Library attribution yet. 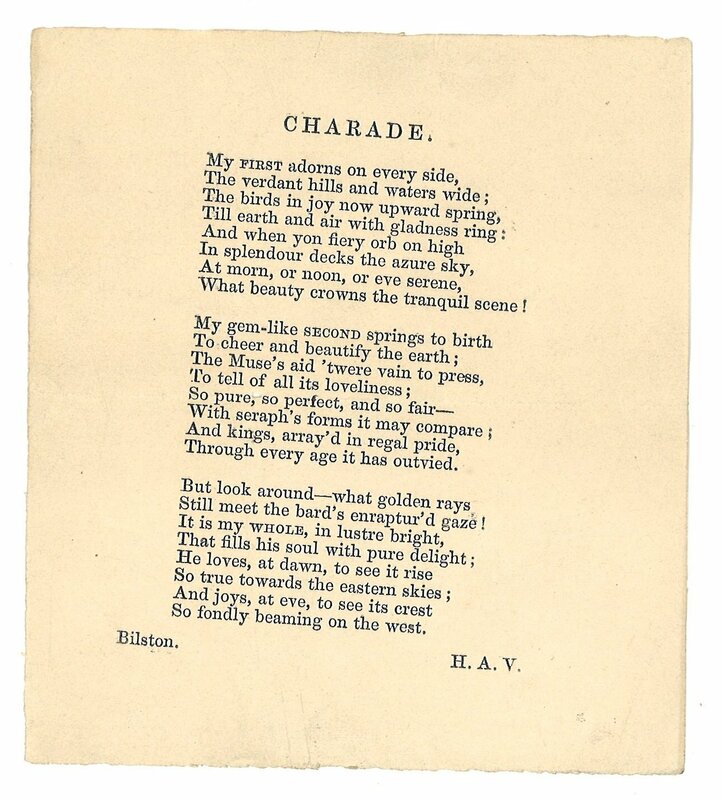 Charles Fox published Cartouche, the French Jack Sheppard which was tentatively (“I should imagine it may have been written by Frank Mercer”) attributed to ‘Frank Mercer’ by Henry Steele, in a letter to Barry Ono, but it seems unlikely that Walter Percy Viles was the author. 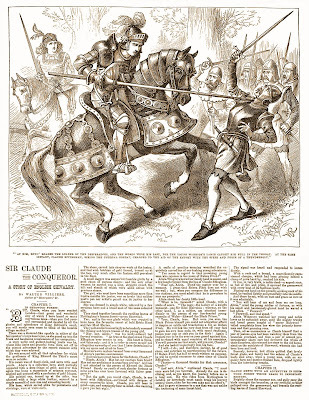 Sir Claude the Conqueror, in Young Folks, October 1, 1881. As Frank Mercer he wrote Florello; or, The Slaves of the Sapphire and The City Watch; or, The Secret of the Forty Footsteps for The Young Englishman. Also under the Mercer pseudonym he wrote Fred of the Falcon; or, The Flying Dutchman (reprinted in George Emmett’s Young Australian story paper), My Bonnie Brown Mare, and Ulva’s Chief; or, The Wraith of Loch Gyle for The Young Briton. He contributed Catch me Who Can; or, the Magic Horseshoe, to The Sons of Britannia as Walter Villiers. Silverspeare; or, The Magicians of Arabia, in Young Folks, September 12, 1874. 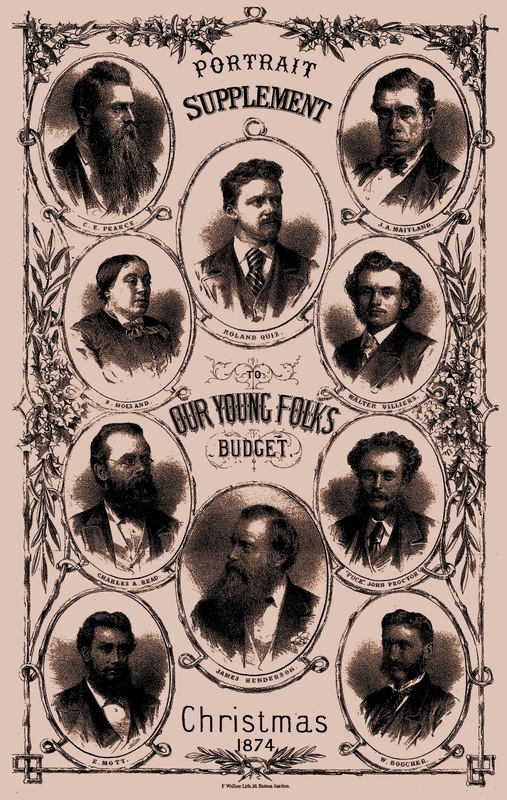 Walter Percy Viles’ most famous titles were done for James Henderson’s Young Folks’ Weekly Budget (a title that went through frequent changes) beginning with Silverspeare; or, The Magicians of Arabia, which began in Volume 5, No. 188, August 1, 1874 by ‘Walter Villiers’. 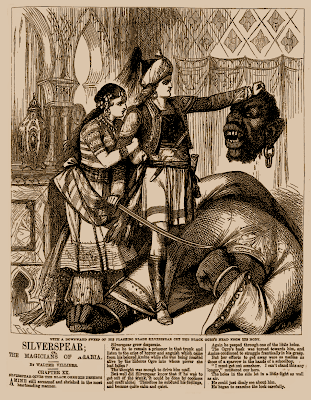 Silverspeare was followed by two sequels titled Silverland; or, The Further Fortunes of Silverspeare (January 2, 1875) and The Golden Helen; or, the Further Adventures of King Silverspeare (January 1, 1876). His last title for Young Folks was Sir Claude the Conqueror, begun on October 1, 1881. One Henderson title, Prince Charming, was published in book form but we have not been able to find this in the Young Folks periodical. London Gazette, April 29, 1892. In the 1881 census Edward Viles was listed as ‘Editor and Author General Literature.’ Two weeks after he turned fifty he died, on December 8, 1891, at 16 Wetherby Gardens in Kensington. The cause of death was Typhoid fever, a disease which claimed his daughter around the same time. His parents outlived him. Both died at Edmonton in Middlesex; his father Henry Andrew Viles in 1894, his mother Eliza in 1901. Arthur Ernest Viles, editor, author, and journalist, was born at Bilston, Staffordshire in 1852. He wrote Drops in Life’s Ocean, a book of original verses reprinted from Punch, The St. James’s Gazette and The Whitehall Review. The book was published in London by Houlston and Sons in 1888. Arthur Ernest Viles died on September 6, 1924. 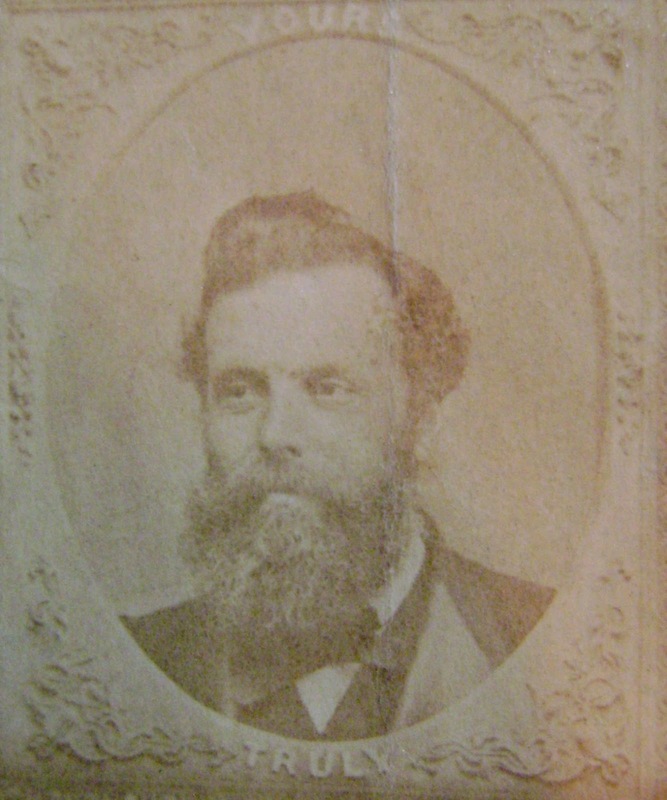 The photograph above bore an inscription on the front: Walter Percy Viles, (the son of Walter Percy Viles the writer) from his Uncle Arthur, dated November 24, 1888. Edward Viles married Annie Bennett on November 22, 1863, at St. Luke’s Church, Bilston, Staffordshire. The last of the literary Viles were Edward and Annie’s two sons, Edward Bennett Viles and Harold Bennett Viles, publishers. Son Harold Viles was a partner in Harrison and Viles (probably Edward Harrison, or one of his sons) at 135a Salisbury Court in 1897-c.1920. 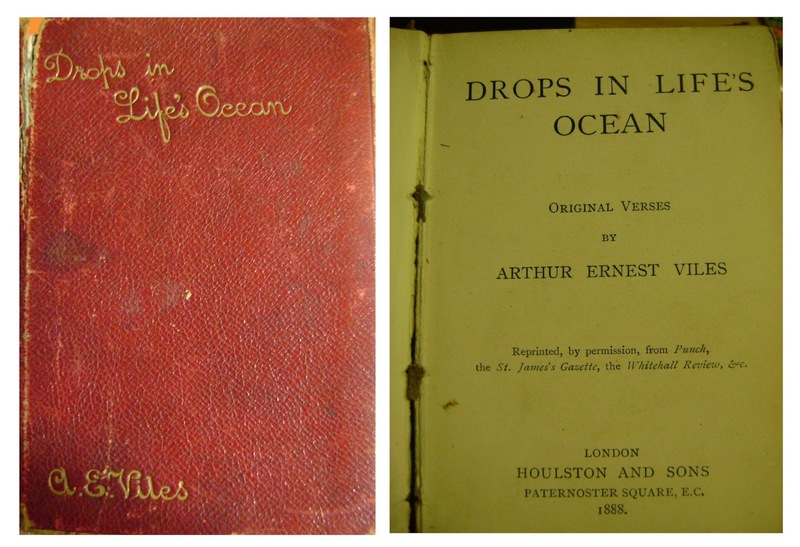 Drops in Life’s Ocean, 1888. Under the pen name ‘E. 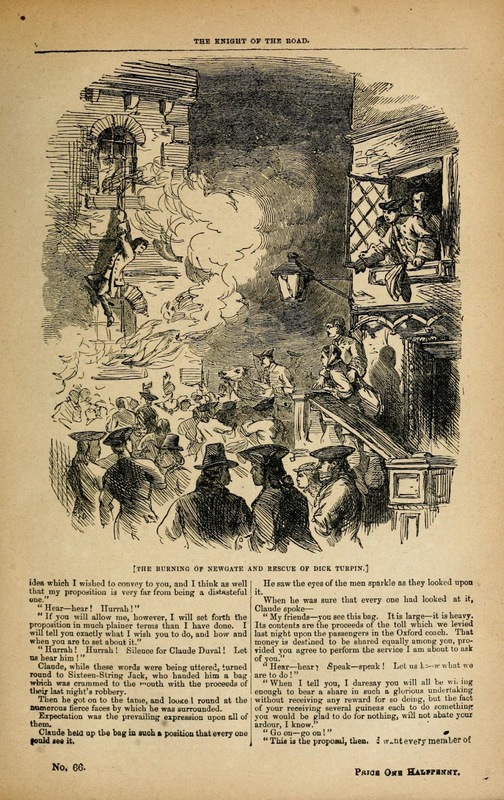 Bennett’ three penny dreadfuls by Edward Bennett (b.1867 in London) and Harold Bennett (b.1868 in Bilston) were published around 1890-91. The titles were Paul’s Perils; or, the Days of Jonathan Wild, Marquis of Dalewood, and Rankley Grange, all by the same anonymous author. Edward Bennett Viles, journalist, author and publisher, left for Melbourne, Australia on the “Sophocles” (The Aberdeen Line) from London on November 6, 1924. He died in Australia in 1939. 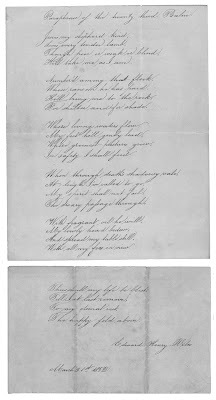 Paraphrase of the Twenty Third Psalm, by Edward Henry Viles, March 25, 1853. Occupations listed for Harold B. Viles in the census records were ‘manager for book publishers’ in 1901 and ‘journalist’ in 1911. He died in June 1937 at Islington. He was married to Kate Elizabeth Burroughs in 1899 at Hampstead. In the 1911 census his stepdaughter Olive Hester Ada Burroughs was listed as a journalist, aged 23 years. She appears to have been the daughter of James C. Burroughs, a journalist and his wife Catherine. In the 1861 census he was a newspaper editor married to Catherine H. Burroughs, who was editor in 1881 of Young Ladies Journal, a ladies fashion paper published by Edward Harrison and Edward Viles. In the 1891 census her Christian names appeared reversed; she is then listed as Hester C. Burroughs, still as editor of Young Ladies Journal. Black Bess, Volume I, No. 66, illustration by Robert Prowse. Our special thanks to Hester Viles, daughter-in-law of Walter Richard Viles, for family photographs and mementoes. More information about Edward Henry Viles, Walter Percy Viles, and Robert Louis Stevenson can be found in a previous post titled ‘The Author of Black Bess’ – HERE.